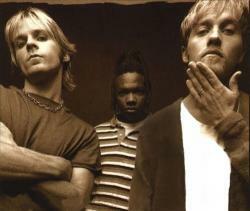 DC Talk�(styled as�dc Talk), was a�Christian rap�and�rock�trio. The group was formed in�Lynchburg, Virginia�in 1987 by�Toby McKeehan,�Michael Tait, and�Kevin Max Smith. They have released five major studio albums together:�DC Talk�(1989),�Nu Thang�(1990),�Free at Last�(1992),�Jesus Freak�(1995), and�Supernatural�(1998). In 2002, the�Encyclopedia of Contemporary Christian Music�called DC Talk "the most popular overtly Christian act of all time." In 2000, the group released an EP titled�Solo�which contained two solo songs from each member. Since that time, DC Talk has been on an indefinite hiatus, and the three band members have each led solo careers. They have performed and recorded individual songs together several times during the 2000s, although the group never officially reunited or disbanded. The group's musical style evolved significantly throughout their career. Their first two releases,�DC Talk�and�Nu Thang, were of the�hip hop�genre. DC Talk's third album,�Free at Last, also mainly took influence from the hip hop style, although their music began taking on a�rock�sound. The trio's last two albums,�Jesus Freak�and�Supernatural, were predominantly�pop rock.